Drove another 400-plus miles through picturesque country, though without seeing anything much of distinction. The first hours, through the Ozarks, were marred by fog; by the time I came out of the fog, the terrain was flattening out for the rice belt of northeastern Arkansas andsoutheast Missouri. In Missouri I stopped for another helping of throwed rolls at Lambert's Cafe in Sikeston -- I ordered country ham, prepared with about three times the necessary salt. After a brief stop at the "Boomland" fireworks/souvenir store, I followed 62 across the same bridges US 60 follows to cross the Mississippi and Ohio Rivers at Cairo, IL. 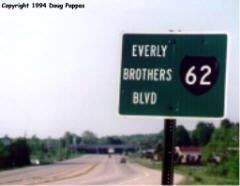 60 and 62 actually spend only 2/10 of a mile on Illinois soil between bridges. Both the Mississippi and Ohio Rivers were noticeably higher than normal -- maybe not quite a flood, but pretty close.